Engineer and communal worker (died in London Feb. 9, 1895); was the eldest son of Count Salamon Henri d'Avigdor and of Rachel, second daughter of Sir Isaac Lyon Goldsmid. He was educated at University College, London, and the University of London. Having been articled to the engineer Hawkshaw, D'Avigdor in 1862 went first to Hull, then to Rangoon (Burma) in connection with his professional work. He supervised the construction of railways in Syria and in Transylvania, and of water-works in Vienna. It was D'Avigdor's railway experience added to his interest in Palestine as chief of the Chovevi Zion Association which led him to contract in railway work in Syria and to form the Tyrian Construction Company. Gaining some experience in literary work in connection with "Vanity Fair," he bought the "Examiner." He subsequently brought out a paper called the "Yachting Gazette." Under thepseudonym of "Wanderer," D'Avigdor published many hunting stories of merit for which he was well qualified, being himself an intrepid rider to hounds. 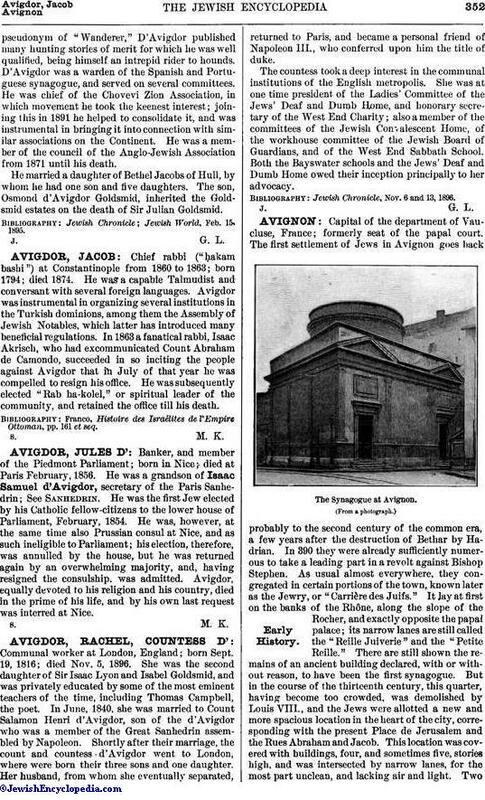 D'Avigdor was a warden of the Spanish and Portuguese synagogue, and served on several committees. He was chief of the Chovevi Zion Association, in which movement he took the keenest interest; joining this in 1891 he helped to consolidate it, and was instrumental in bringing it into connection with similar associations on the Continent. He was a member of the council of the Anglo-Jewish Association from 1871 until his death. He married a daughter of Bethel Jacobs of Hull, by whom he had one son and five daughters. The son, Osmond d'Avigdor Goldsmid, inherited the Goldsmid estates on the death of Sir Julian Goldsmid. 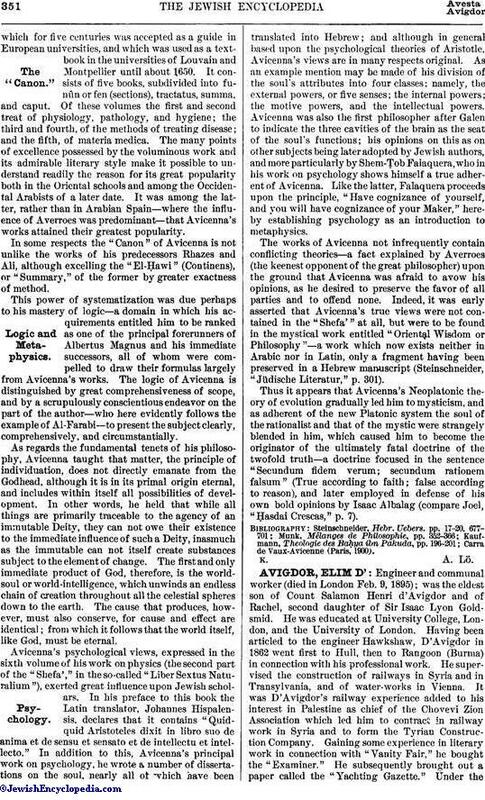 Jewish World, Feb. 15, 1895.